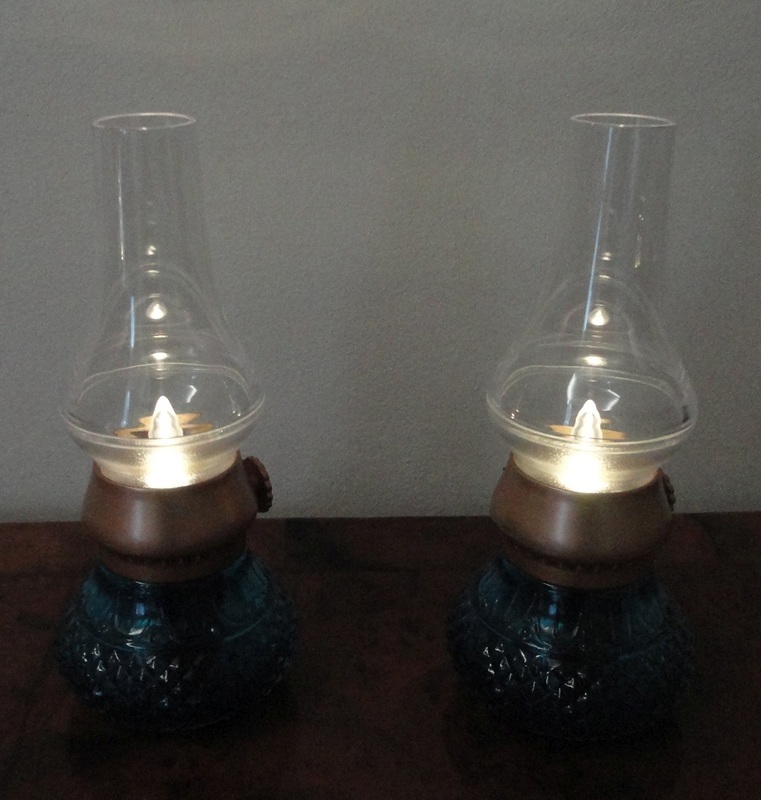 Cut glass in a saturated shade for this retro-inspired small lamp which reminds me of a miniature gas lamp. We chose blue, but other colours are available (red and green). A decorative accent, but also useful to find your way in the dark, as a bedside lamp or to comfort a child during a power outage. I would not call it a reading lamp, unless you have a backlit Kindle or tablet. 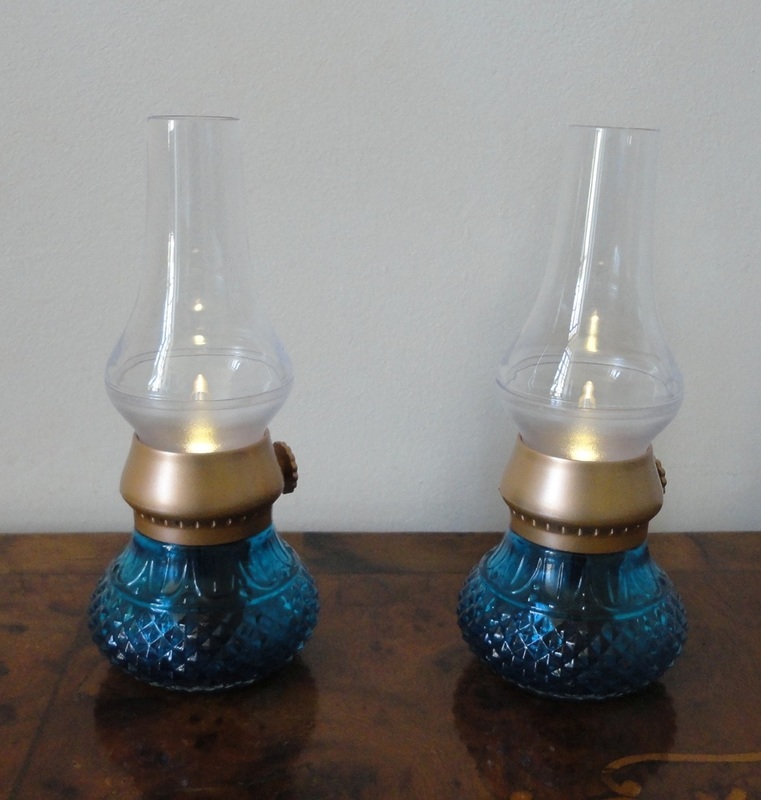 The charming feature is that it can be turned on (and off) by blowing on the “wick” at the interior of the glass top. 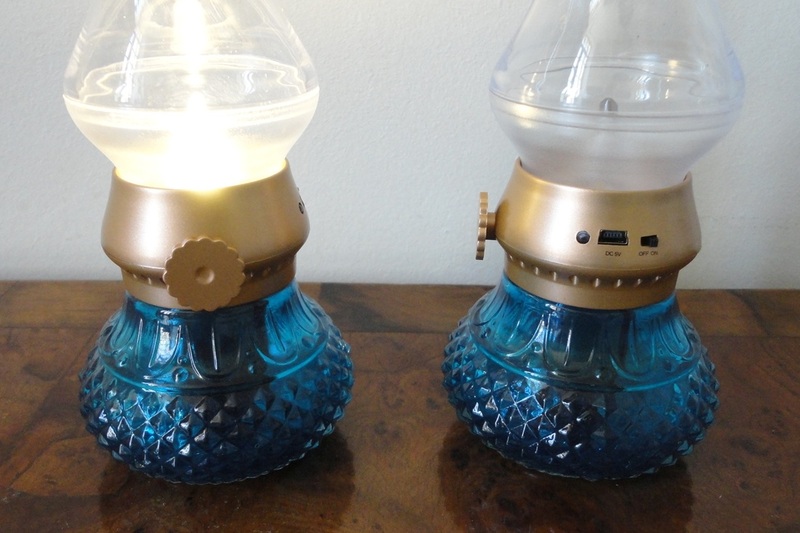 The switch needs to be ON and, in this position, the lamp has a tiny blue LED spot which glows gently, allowing you to find it in the dark. 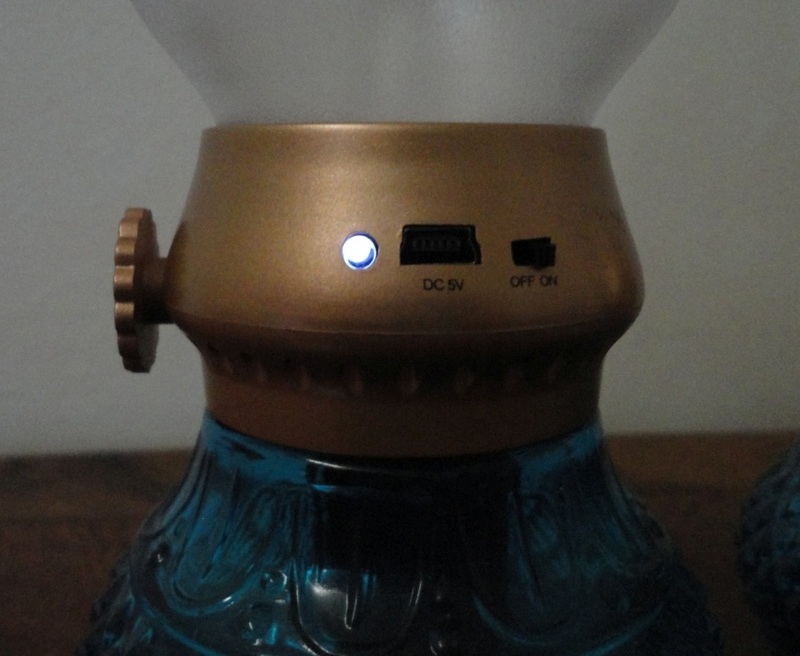 After “blowing” the lamp on, the light intensity can be boosted by turning a small knob. At full power, it gives out a fair amount of white light but, as I said before, not enough to read by. At the lowest setting, the light flickers, imitating a real flame. Splendid ambient light, very decorative and quite beautiful even when switched off. 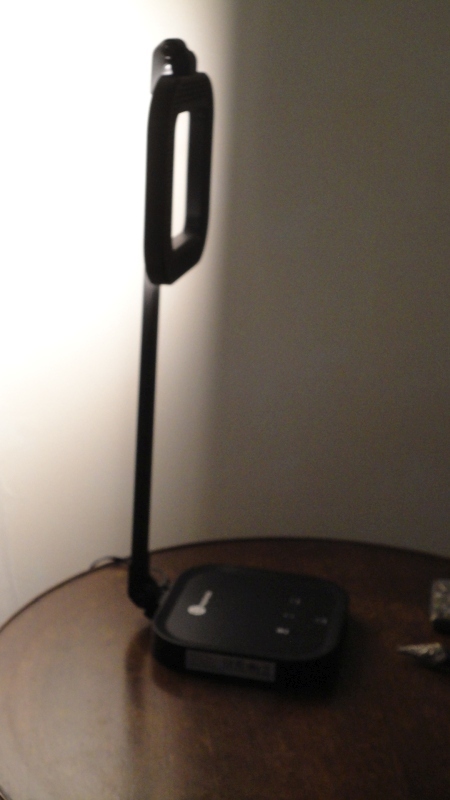 The other feature I love is that this lamp does not require connection to a power outlet, nor does it need batteries. It has an integral 1200mAh lithium battery which can be quickly recharged using the USB cable provided. 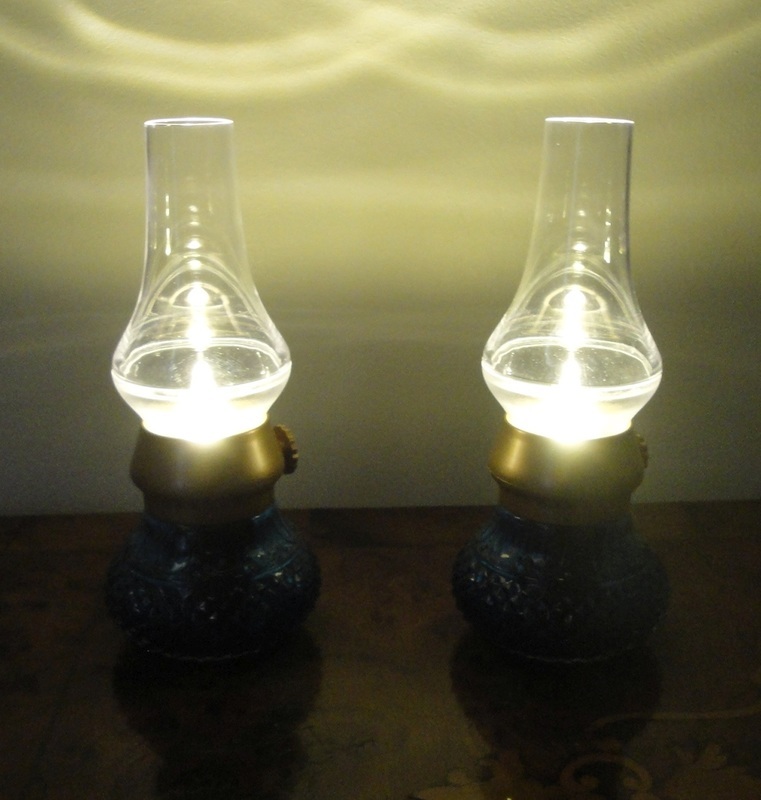 The small size makes them easy to place even on a small side table (8 inches high, diameter of 3.25 inches) (20 x 8 cm). I find it charming, especially if you put two together on a sideboard. 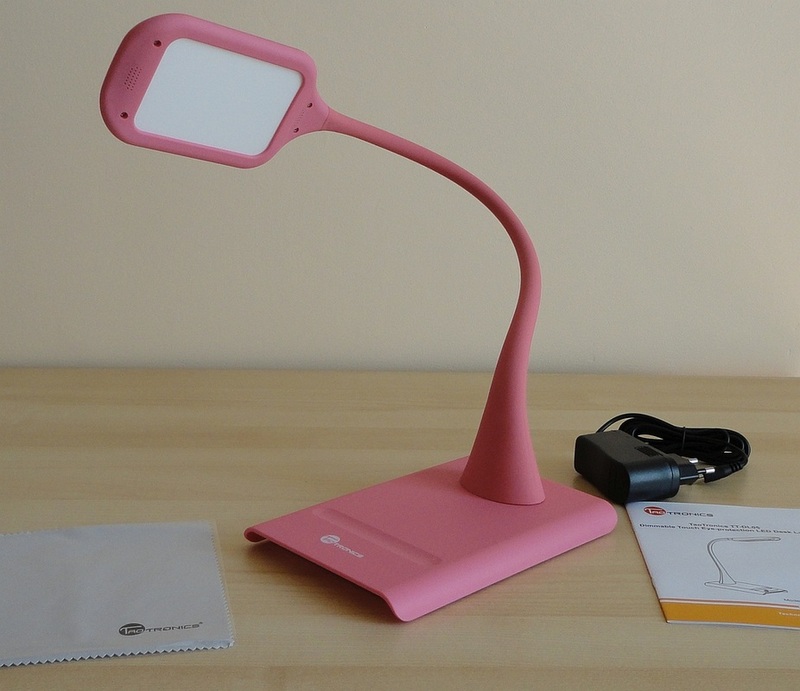 A very trendy LED lamp offering a full range of eye-saving, vision-friendly light levels. The square shape effectively diffuses light over a wider area and the smart, shiny black finish looks good in any décor. The base is flat and large enough for stability. 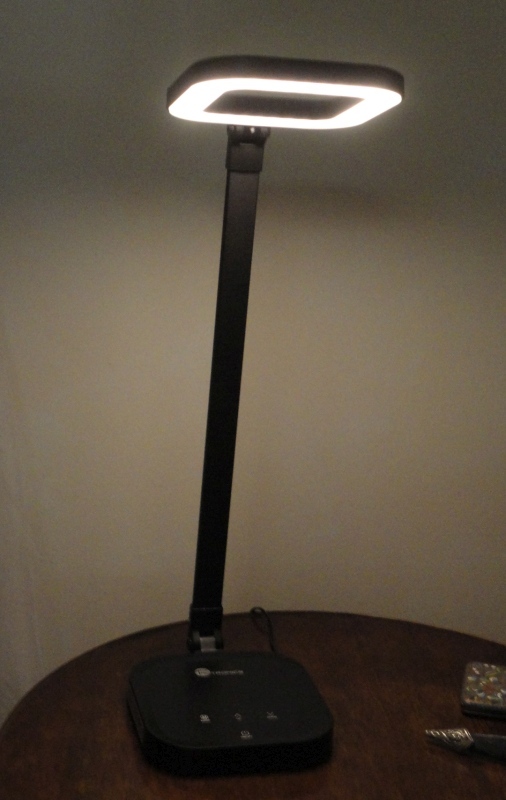 The neck and the LED unit head can incline forwards and backwards by a full 180º, giving great adjustability. The LED bulb casts variable light (from pure white to relaxing amber) which is soft and kind to the eyes. Brilliant as a bedside reading lamp as I can position the light to fall precisely on my book, or point away from my Kindle, minimizing the amount of glare in the room, so my husband can sleep undisturbed. Everything about this lamp speaks of thoughtful design and versatility. 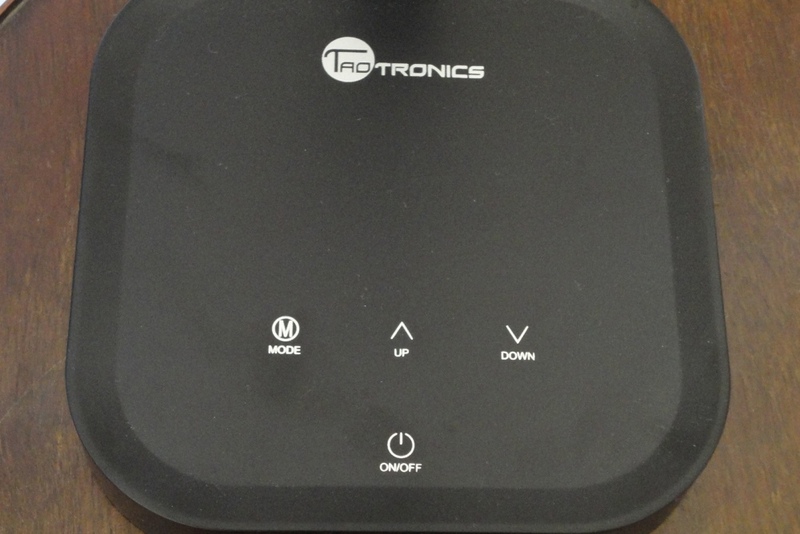 There is a mini panel on the base with touch controls for OFF/ON, three distinct modes (Read, Relax and Sleep) and, within each mode, five levels of intensity. The USB port is a nice touch : it allows me to recharge my Kindle while reading, or my phone while keeping it within easy range. The specs are impressive: max energy consumption of 10W; running costs are a fraction of a similar incandescent lamp; free extended warranty. I love the Memory function : it means I can switch on the lamp on the dimmest setting without waking up my hubby. 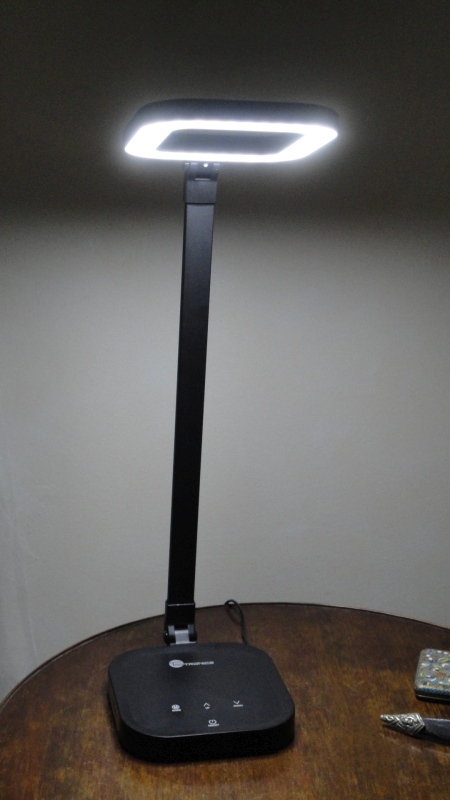 I am really impressed by this lamp's performance and quality build. This is a cute and practical way to light a dark corner, or supply task lighting in those difficult locations where there isn't a wall outlet available. When I accepted a sample to evaluate and review, I had not grasped its full potential. It turned out to be smaller than I expected but it certainly has the power to illuminate the pages of a book, or a computer screen or keyboard (as it's doing for me right now). Also, it has the great advantage of being able to stand on its little non-slip base (not the most secure of options, but doable) or you can clip it to a shelf or the edge of a table. The jaws of the clip open to a maximum of perhaps 1 ½ inches but, realistically, its comfort gripping zone is around 1 inch. The neck is infinitely adjustable and can be bent and twisted at will when clipped, but will need to be balanced if you want to rest the lamp on its stand. The lamp has one simple touch zone for On and Off and three levels of light intensity. It casts a pure white light which is soft and kind to the eyes but can be boosted to a reasonably high level. I love the fact that I can position the light exactly as I want it, while minimizing the amount of glare in the room, so my husband can sleep undisturbed. 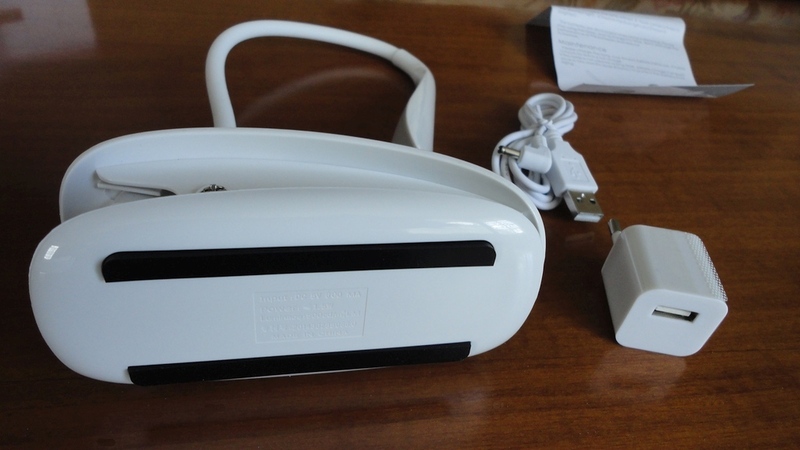 It comes with a USB charging cable and a wall adapter. The recommended first charge takes about eight hours, and, after that much less. Autonomy is quite reasonable, up to four hours at the brightest level. I see this as an indispensable travel companion, great for camping but also useful in a car, in any dark corner, and as a discreet bedside lamp. That's how I use it. The flexible neck lets me point the LED away from sleeping eyes and, if you have an old-fashioned hard-cover, you can attach it to the book itself. It's such a pretty, quirky thing, it goes with just about any décor. 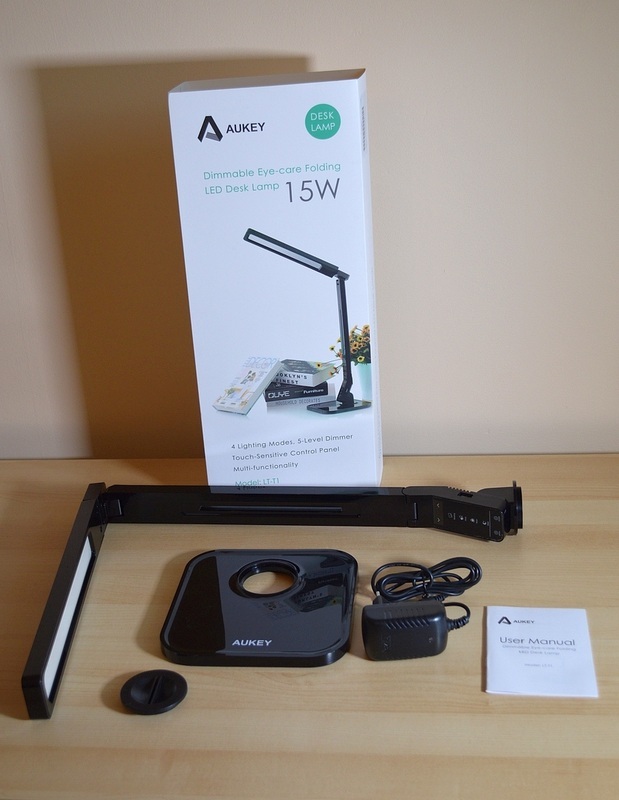 A very trendy LED lamp offering an impressive range of eye-saving, vision-friendly light options. The spare, angular shape with its smart, shiny black finish makes a contemporary statement and looks good in any décor. The base is flat and large enough for stability. The neck can incline forward by 40º, the LED unit and the stem turn all the way around offering great adjustability. The LED bulb casts variable light (from pure white to relaxing amber) which is soft and kind to the eyes. Brilliant as a bedside reading lamp as I can position the light to fall precisely on my book, or point slightly away from my Kindle, minimizing the amount of glare in the room, so my husband can sleep undisturbed. 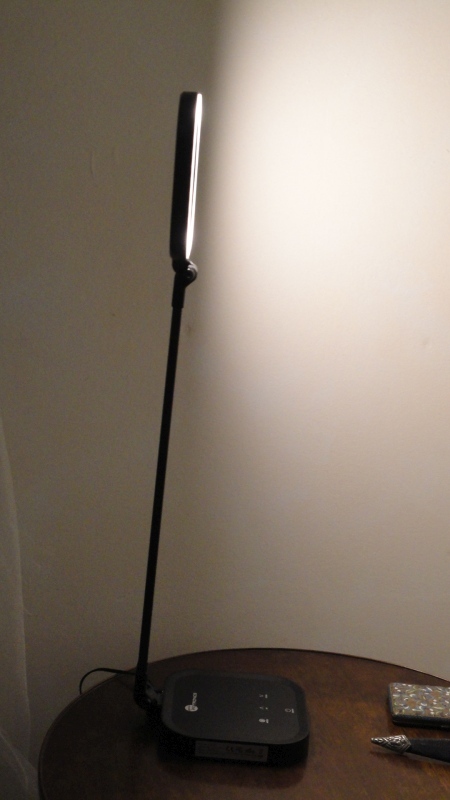 The lamp requires minimal assembly (the stem screws into the base). Everything about this lamp speaks of thoughtful design and versatility. There is a mini panel near the base with touch controls for OFF/ON, four distinct modes (Read, Study, Relax and Sleep) and, within each, five levels of intensity. There is even a one-touch timer that turns the lamp off after an hour. Perfect for those, like me, who fall asleep while reading. And finally, the USB port is a nice touch allowing you to charge a phone or tablet while reading or studying. I found the specs impressive: max energy consumption of 15W; running costs are 20% of a similar incandescent lamp; estimated bulb life: 20 years. 18 months warranty. 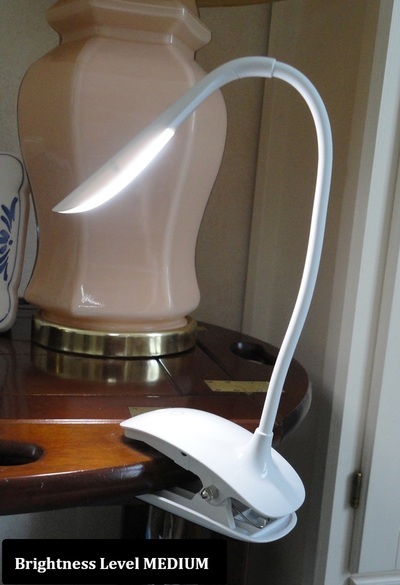 The LED bulb is not replaceable, so once that goes, the lamp is finished. However, if the stated life span (20 years) is achieved, I would not complain too much. 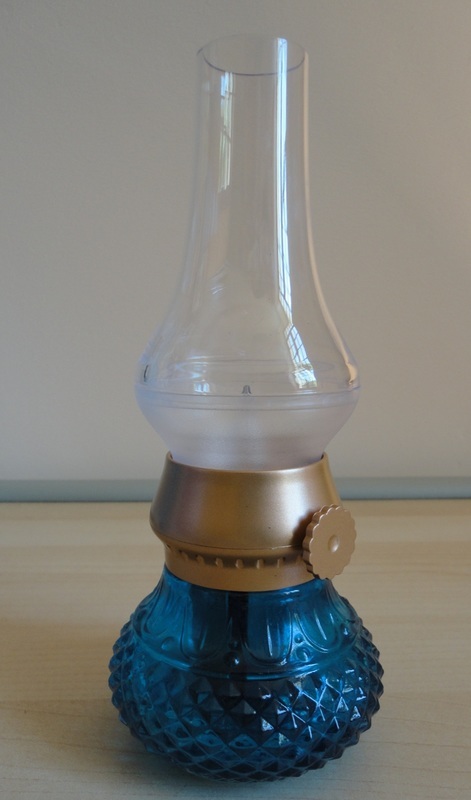 The lamp components are said to be easily recyclable and not harmful to the environment. I am really impressed by this lamp's performance, and delighted to have been given a sample for review purposes. The video shows the very simple assembly, and gives an idea of the light levels. LED lighting is the smart lighting choice and has been steadily improving. 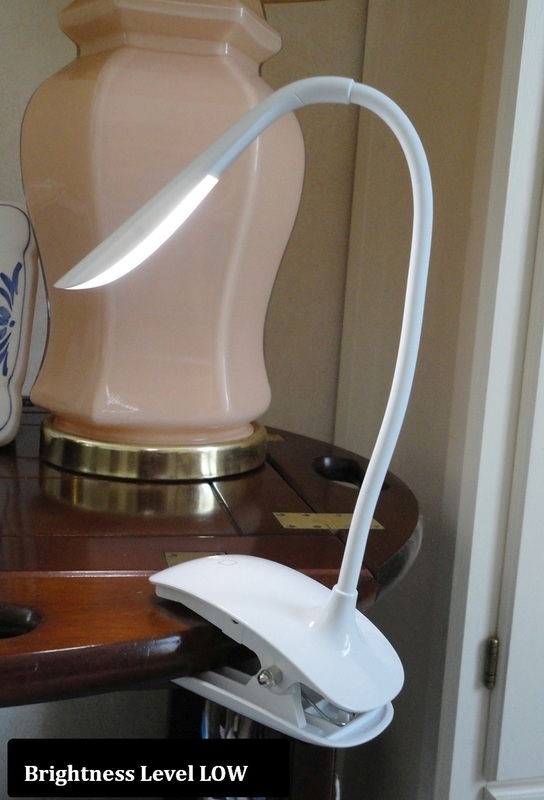 It looks fantastic in this desk lamp with an incredibly adjustable neck. The base is very flat and quite large, offering great stability. The four rubbery pads are a nice touch, protecting the surface below and discouraging sliding. 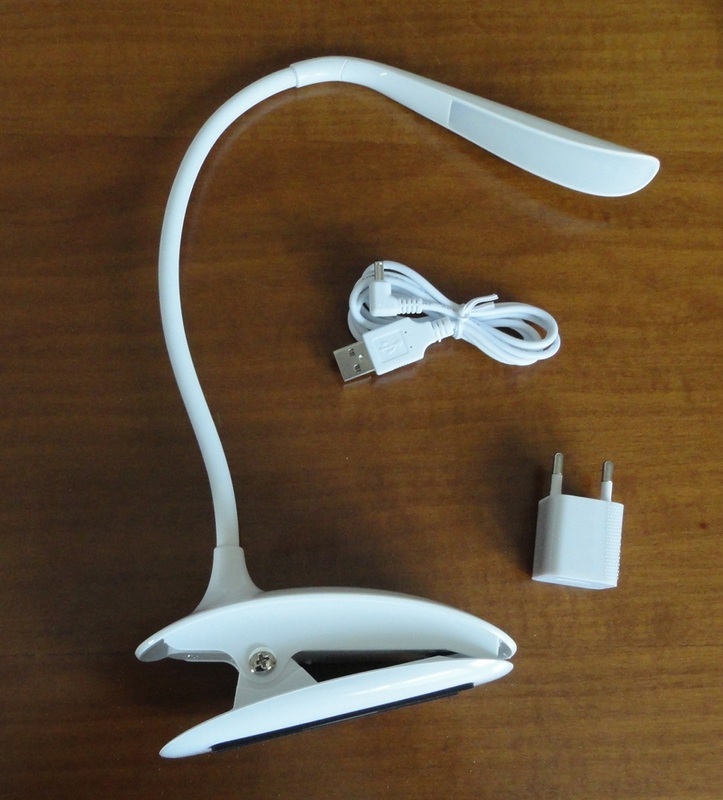 The flexible neck can be twisted into whatever position you wish and the LED unit itself casts a pure white light which is soft and kind to the eyes but can be boosted to a very high intensity. I love the fact that I can position the light to fall precisely on my book, while minimizing the amount of glare in the room, so my husband's sleep is not disturbed. Operation could not be easier. Just connect the 6 foot adapter cord at the back of the base and plug the other end in a power outlet. There is no ON/OFF switch. When the lamp is plugged in, a dot of red light marks the groove you touch to switch the light on or off. 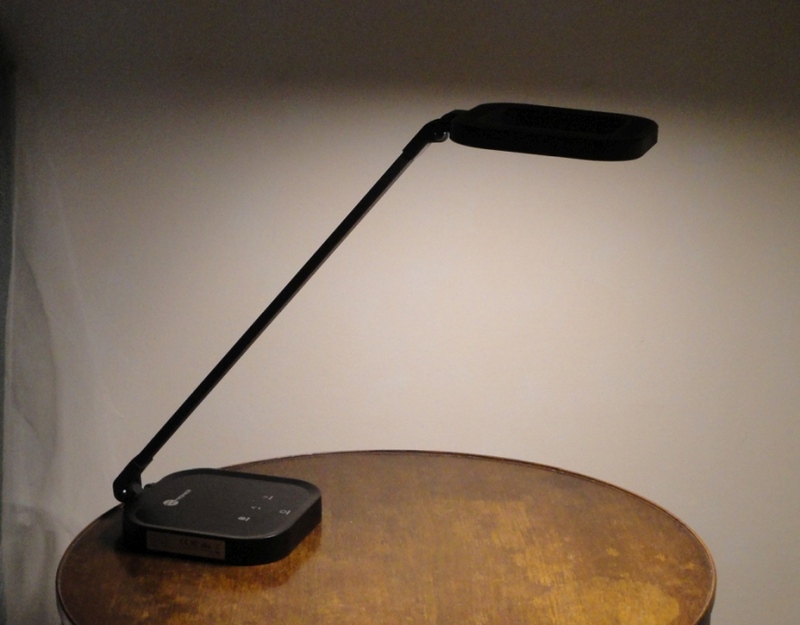 The groove is also a dimmer, so that sliding your finger from left to right takes the light from bedside reading to clinically stark levels and it even remembers the last setting. The specs are certainly impressive: energy consumption of 9W; running costs are one quarter of a similar incandescent lamp, estimated bulb life: 40,000 hours or 25 years. No UV or radiation. The finish is pleasingly matt. The only thing I'm not crazy about is the colour. Bubblegum pink might be OK for a young girl's bedroom but it looks out of place in my house. 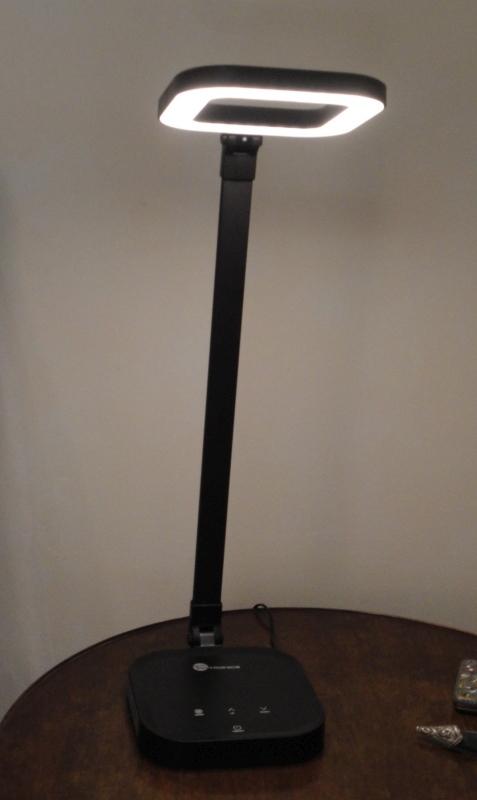 However, as I was given this lamp for evaluation purposes, it would be unfair to dock half a star, especially since TaoTronics also make this lamp in a stylish and much more decor-friendly black. Oh, and they have even provided a nice cleaning cloth.